Is there no end to this woman's penmanship? Every time I turn around, she's got another book out. On almost every Wednesday she's on The Montel Williams Show, he has another book of hers to plug. I'm not complaining because I adore everything she's written (that I have read so far) and truly believe she's got more than a message or two for us. What she says, at least to me, makes so much sense. I heard her say to Montel that she wrote this book after the books and movies like The Da Vinci Code and The Passion of the Christ. Ms. Browne's book "contains logical and truthful information from my spirit guide, Francine". Sylvia writes about the virgin birth of Jesus (what she says is more credible), his life teaching others, his marriage (makes a whole lot of sense! ), his mother, his disciples, and she dissects the gospels of Matthew, Mark, Luke, and John with conviction. The Bible (New Testament) is not the most reliable and consistent source as it was written by men hundreds of years after "the facts". After all, we take the Bible literally, and why, when there's no conclusive evidence that all it says is true? I completely agree with Sylvia, and applaud her for echoing my same belief: "I have never been able to understand how any person or group can say or put forth that they have all the answers and truth and that anyone who doesn't follow their belief is damned or doomed to hell or something even worse". This is one of the reasons I shun people who quote Bible verses as a form of scorn to others who don't "believe". We live in an age where things are more easily explained and investigated. I take this book as coming from the horse's mouth - the horse in this case, God. 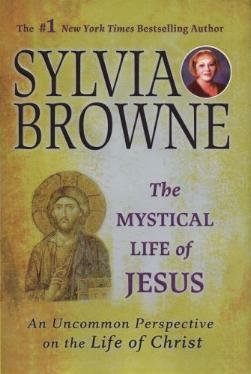 Visit Sylvia Browne at her website. Conclusion - Believable. I urge you to read this book. Do so with an open mind. Digest what Sylvia says. Then re-look at your beliefs. Other reviews of Sylvia Browne's books.